HOME > Books > Related Topics > Sunk! Mochitsura Hashimoto, Japan's most famous WWII submarine captain, combines in Sunk! his personal wartime experiences and a general history of the Japanese submarine fleet during WWII. His fame mainly comes from being commander of the submarine that unleashed six torpedoes at the heavy cruiser USS Indianapolis (CA-35) on July 29, 1945, shortly before midnight. Three torpedoes struck Indianapolis, not zigzagging at the time to take evasive action. The warship sank in about 15 minutes, and almost 900 crewmen lost their lives during the attack and in the water afterward as a rescue plane did not arrive until four days after the sinking. Hashimoto's renown also comes from this book published first in Japanese and then in this English version translated by Commander E. H. M. Colegrave, Royal Navy (retired) and first published in 1954. Hashimoto was one of very few Japanese submarine commanders to survive the war, since Japan's submarine fleet was almost entirely wiped out. It suffered total losses of 130, and at the end of the war the decimated fleet only had four large submarines (seven, if three transports included) and eight obsolete submarines. Sunk! provides fascinating insights into two aspects of Japan's tokkotai (special attack forces), which carried out suicide attacks against enemy ships. Hashimoto gives firsthand accounts of submarines that launched midget submarines and kaiten manned torpedoes. He served as torpedo officer for the submarine I-24, which carried one of the five midget submarines launched at Pearl Harbor on December 7, 1941, at the start of the Pacific War. He explains that the midget submarine launched from I-24 was delayed by a gyro failure. One I-24 midget submarine crewman, Ensign Kazuo Sakamaki, was captured and became America's first prisoner of war after his midget submarine ran aground. None of the five midgets returned to the recovery area where the mother submarines were waiting. Although technically a midget submarine launch was not a suicide attack since the two-man crew had a chance to be recovered, Hashimoto writes that the officers commanding these craft set out with the belief that they would not return, since they left final farewell letters for their parents. The Japanese Navy classified these midget submarine crewmen as dying in battle as part of a special attack mission in the same way as kamikaze pilots later in the war who did not return. The last six chapters of Sunk! cover the four kaiten missions of the submarine I-58 commanded by Hashimoto. In the first mission named Kongō with six total submarines, I-58 departed mainland Japan with four kaiten on December 29, 1944. Hashimoto launched all four kaiten piloted torpedoes at ships in Apra Harbor at Guam Island on January 12, 1945. A loud explosion took place, but I-58 could not confirm any hits since she had to dive and make off when an aircraft appeared. This book mentions in several places the difficulties that the submarine commanders had in confirming kaiten battle results. Submarine I-58 with four new kaiten set off toward Iwo Jima on March 1, 1945, with one other submarine as part of the Jinmu Group. When I-58's four kaiten had been manned and ready for launch, Hashimoto received an order that the operation was canceled and that I-58 needed to proceed to Okinoshima to serve as a wireless link ship for a Combined Fleet operation. He thought about launching the kaiten anyway but decided against it and had to jettison the kaiten after the four pilots returned to the submarine. Tatara Group with four submarines, including I-58 carrying four kaiten, left Japan on April 2 with the same pilots as in the aborted Jinmu mission. Due to bad weather and harassing enemy aircraft, the mission did not go as planned. The kaiten were inoperable after I-58 had been away from base for over a month, and upon Hashimoto's return he found out two submarines carrying kaiten in the Tatara Group had failed to return and the other submarine had returned to base after damage in an enemy attack. Hashimoto's last kaiten mission as Commander of I-58 was with the Tamon Group. I-58, carrying six kaiten, left Japan on July 18. The first battle action was the launching of two kaiten toward an enemy tanker with an escorting destroyer on July 28. The sinking of the heavy cruiser Indianapolis took place the next day just before midnight when I-58 launched six torpedoes. Before the end of the war on August 15, Hashimoto launched three more kaiten at enemy vessels. The chronology of this book at times gets confusing as Hashimoto shifts from his personal accounts to the general history of particular aspects of Japanese submarine fleet operations. For example, Chapter 5 entitled "Destruction of Commerce" covers attacks on enemy merchant ships by the Japanese submarine fleet from December 1941 through 1944, but then Chapter 7 shifts back in time to tell the role of Japanese submarines in the Battle of Midway in early June 1942. After Chapter 12 describes the massive American air attack on Truk in February 1944, Chapter 13 starts its account of Japanese submarine operations in the northern Pacific in November 1941 and ends in June 1943. The highlights of Sunk! are Hashimoto's accounts of his personal experiences as commander of submarines RO-44, I-158, and I-58 and as torpedo officer aboard I-24. The chapters covering the general history of Japan's submarine fleet also contain some fascinating stories and incisive commentary, but by and large they lack the intimacy and continuity reflected in Hashimoto's personal accounts. These chapters provide the overall history as gathered together after the war by Hashimoto through discussions with Soemu Toyoda, former Commander in Chief of the Combined Fleet; Shigeru Fukudome, former Naval Chief of Staff; and many other former naval officers. 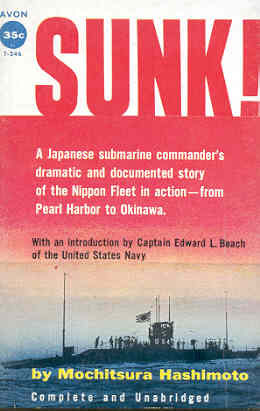 The book has no bibliography of written sources but does include helpful references in appendixes that provide details of submarines in the Japanese fleet, claims of commerce ship sinkings by Japanese submarines, details of Japanese submarine losses, and a summary of Japanese submarine campaigns. A weakness in the general history presented by Hashimoto in Sunk! is that he does not try to confirm or analyze the Japanese Navy's claims of battle results by referring to US Navy sources, so many unexplained inconsistencies remain. The day of decisive action together with three other men on board has arrived. We are all well and in good spirits. Apra is going to be amazed. The moon is pale and the stars sparse and distant. In early January, O Miya Island (Guam), appearing to be silent in sleep, floats before me. Who knows the confusion there will be in a few hours' time? For the sake of our great country we have come to the place appointed. Over twenty-two years of life and it is now just like a dream. The meaning of life will be shown today. As the point of the decisive fight between Japan and America, just to check in one blow our decline and thus to protect for ever the illustrious three-thousand-year-old history of Great Japan. Great Japan is the land of the Gods. The land of the Gods is eternal and cannot be destroyed. Hereafter no matter, there will be thousands and tens of thousands of boys and we now offer our lives as a sacrifice for our country. Let us get away from the petty affairs of this earthly and mundane life to the land where righteousness reigns supreme and eternal. Colegrave, as a former Commander in the Royal Navy, effectively translates naval terminology from Japanese to English, although he mistakes a couple of names of kaiten units. He erroneously refers to the Kikusui Unit, the first kaiten unit to carry out attacks, as the Kikumizu Unit (p. 118). The Jinmu Unit, in which Hashimoto commands one of the submarines carrying kaiten, gets erroneously referred to as the Kamitake Unit (p. 128). Sunk! provides a valuable firsthand source related to special attacks carried out by kaiten manned torpedoes and midget submarines. Hashimoto does not mention the names of the pilots with the exception of Lieutenant Ishikawa in the above letter, but he does describe their actions and feelings. In the book's foreword, Hashimoto describes the entire submarine fleet as a special attack (tokkō) force sent to carrying out suicide attacks: "Throughout the war the whole submarine fleet was in reality a special attack force in which, in the absence of scientific weapons, the crews were just so much human ammunition."